Assign images or video to words. 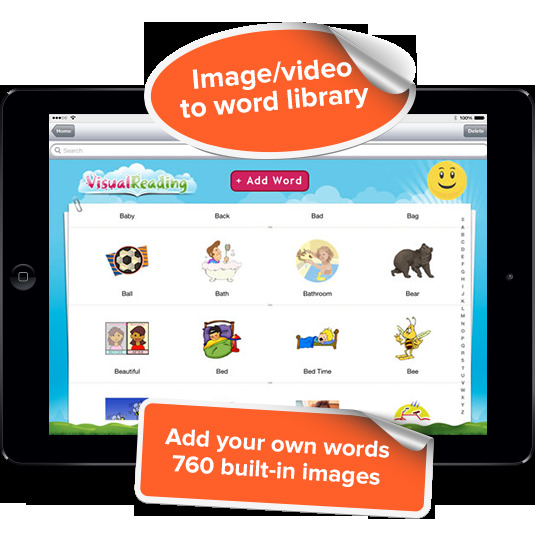 The Visual Reading app was built to assist those with Autism, Dyslexia, or individuals who have difficulty reading with just words. Created by a parent with an autistic child, the idea of associating images to words was inspired by a bedtime reading session. The child was able to read and understand the story when the parent pointed to various images on the book page, whilst reading and pointing at the words. This helped in making a connection between the word and an image. The application works on this idea by allowing the user to place images or videos above each word. Have fun adding your own concrete nouns for everyday common objects that the child is familiar with . Most common nouns are already included in the application but feel free to experiment and add your own. Even add a photo of the subject if appropriate. For some abstract words the user is encouraged to find images or make videos that the child is comfortable or familiar with.